I am a relative newcomer to the topic of OERs (Open Educational Resources). Not unaware of the topic—our Mason Publishing Group has been working with faculty interested in affordable educational materials for some time now—but until late, I haven’t really been terribly involved in those efforts. That changed one afternoon this summer as I grabbed my laptop and tagged along with them to a meeting with the Associate Provost for Undergraduate Education to talk about OERs. As the meeting progressed (and moved ever further from my area of expertise) I started stealing moments to jump in and out of various OER aggregation sites, curious to see the sorts of resources already available on the net. 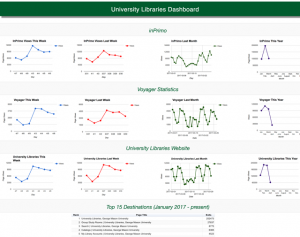 One of our skunkworks projects involves taking real-time Google Analytics data and building a visually interesting dashboard to report out activity on various library sites. A local library made news in 2010, announcing that it would archive every tweet ever posted. With Twitter generating 500 million tweets a day, can we really be surprised that it’s proving to be a challenge? Of course, that doesn’t mean there aren’t a host of smaller services we can build around social media. By way of example, here are three social media services we offer the Mason community. One’s pretty simple while the other two require a bit more infrastructure. This curated feed from “official” and “near-official” twitter accounts from across the university offers a quick and easy way to take the “Mason Nation” pulse. 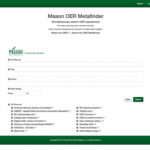 To produce this service, we created a MasonTweeter account on Twitter to follow Mason-related feeds. 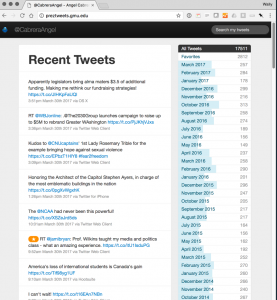 The web presence is simply a page that embeds the MasonTweeter timeline. 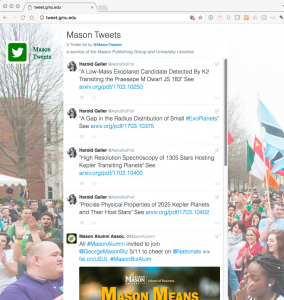 An archive of every tweet from Mason’s President, Ángel Cabrera. This service stems from a discussion I had with Dr. Cabrera a few years ago. At that time, Twitter did not offer users an archive of their tweets (they do now), so we were looking into how we might save his tweets for future university historians. We settled on a method that offers a searchable database of tweets stored locally in a MySQL database (suitable for future archiving). Thanks to Andrew M. Whalen for the code that helped build this LAMP-based archiving service. Just the other day, I set up our most ambitious social media service yet: Social Feed Manager. SFM is a Django application developed by George Washington University Libraries to collect social media data from Twitter. 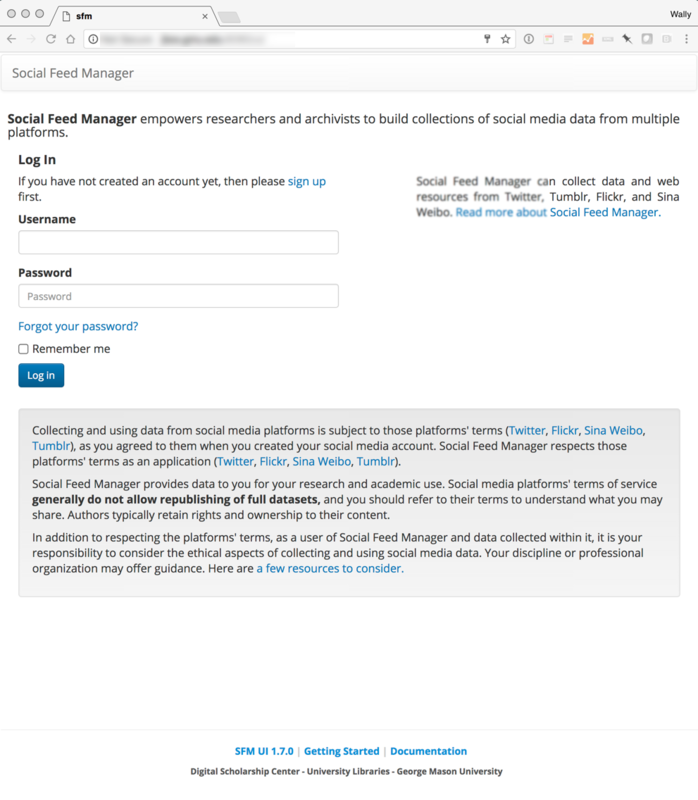 It connects to Twitter’s approved API to collect data in bulk and makes it possible for scholars, students, and librarians to identify, select, collect, and preserve Twitter data for research purposes. We’re running SFM in a Docker container (using Docker for Mac) which simplifies installation and abstracts away much of the underlying complexity. 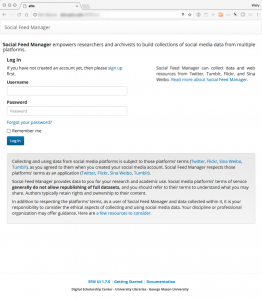 We have added Social Feed Manager to the suite of data services we offer out of the new Digital Scholarship Center we’ve been shaking down in beta since late January. Had an email exchange yesterday with a group that wants to archive a few of their online web projects in our MARS system. Due to what I hope is a temporary vacancy in our staffing, that meant I had to take the lead in explaining how we handle archiving a website and what the end result of that process looks like. I had a solid understanding of the what we do part–it’s pretty straightforward: we point a webcrawler at the up-and-running version of the site and pack what we get back into a WARC file. We then upload that WARC file to the DSpace instance that delivers our MARS service and flesh out the metadata. We’ve done a number of these and it works well. My immediate challenge was mastering the how do we do this. Until recently, the actual work of producing and archiving the WARC file was handled by Jeri Wieringa (who recently moved on from her still-spoken-of-in-reverent-tones stint with our Mason Publishing Group to new challenges). As I started down the WARC-enlightenment path, I was glad to see that our MARS entries for archived sites point the user to WARC-viewing tools for both Windows and MacOS. Seems we recommend Ilya Kreymer’s webarchiveplayer available at https://github.com/ikreymer/webarchiveplayer. So I started there…downloaded and installed the Mac version, pointed it at one of our archived WARC files and in minutes had a pretty firm grasp of this end of the process. What I still didn’t know was precisely how we had been producing these WARC files. While on Ilya’s GitHub repository for webarchiveplayer I noticed a link to webrecorder—which I later learned corresponds to the service deployed at https://webrecorder.io. That looks like a large-scale solution and one I’ll set up and test soon. Until then, I’m going with a very lightweight method….wget. Building the WARC across the net (wget was running on my office iMac at Mason and inodeblog.com lives at reclaim hosting), took roughly 7 minutes. If you’re going to sites you don’t own, you’ll probably want to add a –wait=X switch to pause for ‘X‘ seconds between requests and add your email to your –user-agent= string so people know who to contact if they don’t want to be crawled. I’ll update this post with our “official” method for producing WARCs as soon as I either find a note where Jeri explained our process to me or learn enough to define and document a new standard for us. It didn’t take me long to rediscover that a decent news reader–and a good set of links–is a great and relatively painless way to stay current. After a bit of pruning and with a few new additions, I thought it might be useful if I posted my current feed list. It is a bit idiosyncratic–reflecting my interest in most aspects of digital librarianship. If you have additions I should know about (and I hope there are many I’m missing), send me a link or better yet, an OPML file of your current feedlist. My list as an OPML file is here. Pinboard (Dorthea Salo) You can learn a lot stalking the right bookmarker! Was recently asked to help come up with data to help give the library a better handle on who is using our e-resources–to complement the numbers we have on what’s being used. Hard to be precise given all the variables, but I did hit upon something I think serves as a reasonable proxy (no pun intended). an enormous (70+ million lines) proxy server log that covered all off-campus activity for restricted resources for the entire Fall 2015 semester. This log has NetIDs for users. 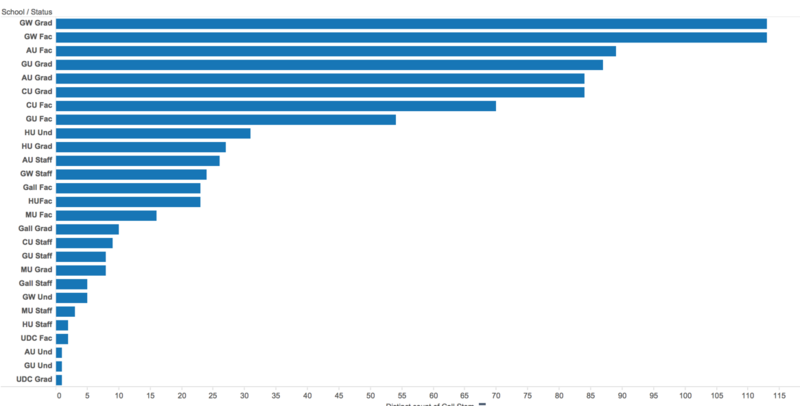 Exported the MySQL results to a CSV file and launched Tableau. 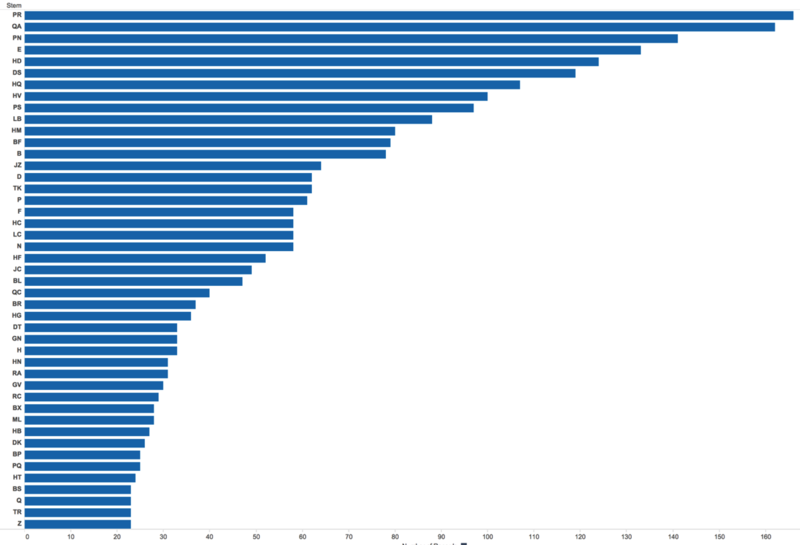 Within Tableau, I joined the results of my MySQL work with the CSV file containing “major codes” and their descriptions (so I could flesh out those NURS, GLOA, PUBP codes). I hit one of Tableau’s “visualization” buttons. Got a chart like the excerpt you see below. Eventually, the complete visualization became an appendix in a document we prepared for internal reporting. If you’re curious, you can download that final chart as a PDF. The zipped versions of these files are roughly 200MB each. Click the link below to retrieve the JSON recordset. The XML version has a couple more data fields (LCCN and SERIES) if available in a record. A steady increase. Graphed, it’s easy to see. I’m going to guess that the jump in use around 2013 coincides with our rollout of the Primo discovery service (metadata for arXiv documents is included in the underlying database). When you consider that we also have users who visit arXiv from off-network devices, it’s an easy decision for us–we are joining arXiv. Membership fee works out to about 14 cents per download (orders of magnitude better than what we see with Elsevier). A Mason reader can request an item held in the collection of any library affiliated with one of these cooperatives and its delivery will be expedited thanks to something rather akin to the “favored nation” status that exists between members of each collective. Graduate students at George Washington are our most active borrowers (with 115 items in circulation). Seems odd but GW faculty are tied with an identical 115 items charged at the moment. As you move down the left column, you find AU faculty coming in third with 89 items, followed by Georgetown graduate students at 87, and so on down the list.